Mondelez International (based in Minworth, West Midlands) are committed to the safety of each and every employee, visitor and contractor. After installing the Sinica Visitor and Staff Management System the detailed process of ensuring that all visitors to site are fully aware of and abide by Site Health, Safety and Hygiene rules has now been made more efficient and vastly simplified. 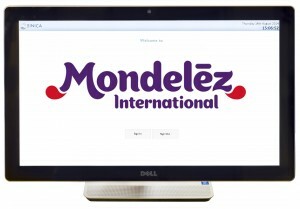 Mondelez were particularly impressed with the Sinica Emergency Roll Call feature, which in the event of an emergency generates a comprehensive report of all persons on-site and immediately sends it to all Mondelez Fire Marshalls and Security Staff. Sinica is successfully implemented throughout the UK Food Industry, including Food Manufacturers, Distributors and Packaging companies, who are all required to implement strict visitor controls.